Introducing the new MSA ULTIMA X5000 gas detector, featuring an advanced OLED display with touch controls, two sensor inputs, and MSA’s patented XCell sensors with new TruCal™ technology. The replacement for the hugely successful ULTIMA X, the ULTIMA X5000 has eliminated any need for a tool or controller, since it can be operated by two touch buttons on the face or via Bluetooth-enabled smartphone, up to 23 metres away. The industry standard has always been one sensor per transmitter, but the X5000 can double its coverage by having the ability to have two sensor inputs into the one transmitter. The ULTIMA X5000 is powered by a series of best in class sensors and its performance is guaranteed by the industry’s most comprehensive warranty coverage. 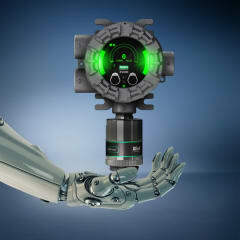 MSA is also introducing a new breakthrough with TruCal™ technology on selected XCell toxic sensors. This innovation compensates for sensor drift due to environmental changes. In other words, the users don’t have to touch or calibrate the detector for up to a year and a half. The high resolution OLED display has been designed in such a way that users can tell at a glance the current status of the detector, keeping safety as easy as possible.